Coca-Cola Coliseum is located on the grounds of Exhibition Place. From The East: Take the Gardiner Expressway west to Spadina/Lake Shore Boulevard cut off and follow the signs for Lake Shore Boulevard. Take Lake Shore Boulevard to the Princes’ Gates (just west of Strachan Avenue). As you enter the Princes’ Gates via Princes’ Blvd, follow the signs to available parking lots. From The West: Take the Gardiner Expressway east to Lake Shore Boulevard. There are entrance points to Exhibition Place from Lake Shore Boulevard at Ontario Drive and Newfoundland Drive. From the Newfoundland Drive entrance, turn left on Princes’ Blvd., and follow the road to parking lots 3 on your right or 2 on your left hand side. To access the underground/indoor lot of the Enercare Centre (formerly the Direct Energy Centre), turn right on Princes’ Blvd. to Canada Boulevard. Turn left at Canada Boulevard and enter the lot on your left. From The North: From the 401, take the Don Valley Parkway south to the Gardiner Expressway west and follow the directions for “From The East”. Alternately, from the 401, take 427 South to the Gardiner Expressway east and follow the directions “From The West”. Take the East-West Lakeshore GO Train to the Exhibition station, one stop west of Union Station. For more GO Transit information call 1-888-GET-ON-GO (438-6646) or visit www.gotransit.ca. From Bathurst Station, board the #511 STREETCAR towards EXHIBITION LOOP. 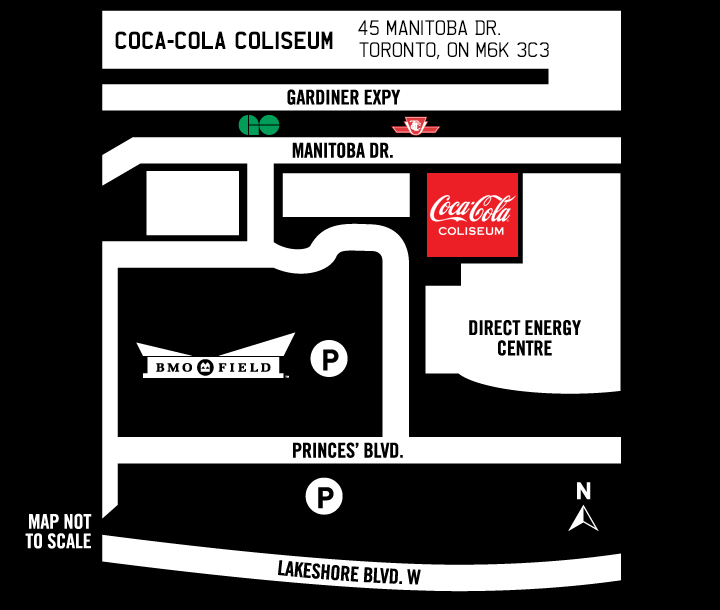 Depart at MANITOBA DRIVE AT EXHIBITION LOOP and head South, following the covered walkway until you reach Coca-Cola Coliseum. From Union Station, board the 509 HARBOURFRONT STREETCAR towards EXHIBITION LOOP. Depart at EXHIBITION LOOP and head South, following the covered walkway until you reach Coca-Cola Coliseum. From Dufferin Station, board the #29 bus south to Exhibition. Service will increase & operate between Dufferin Station and Exhibition every few minutes. Service at Exhibition will terminate at all times at Dufferin Gate Loop. For more TTC information call (416) 393-INFO (4636) or visit www.ttc.ca.